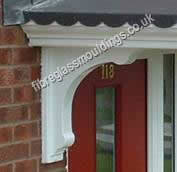 Choosing to install a PVC plastic canopy from Architectural Fibreglass Mouldings Ltd not only makes your house look stylish, but will also protect your door and visitors from the elements. Our range of plastic door canopies includes the classic Roman Door style, the Straight Edge Roman Door style, the Georgian Terraced Door style, and the Strand Door "Over-door" style among others. Each of these PVC canopies provides the same level of performance that you would expect from any of our products, and with a choice of colours, sizes and even styles of decorative legs for your chosen plastic canopy, we can make sure your property looks its best at highly competitive prices. Our PVC canopies can help to create a more welcoming front to your property and they can, in effect, extend your living space, which adds to the value of your property. Every one of our plastic door canopies and GRP products will last the lifetime of your house and will require no maintenance during that time, just a simple wipe down to revive the original sheen. We're proud to provide quality plastic canopies, available in a wide variety of colours and styles to suit your individual taste. Unlike many of our competitors, we have a team of in-house toolmakers so that we can create bespoke PVC canopies for any size of property. With over 25 years experience in plastic canopies we understand that using lightweight and durable materials such as those found in our plastic door canopies means you will receive the best performance for cost and with little scarring to the exterior of the property.